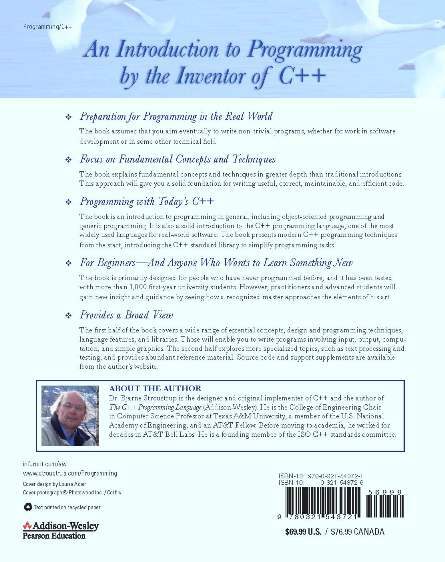 This is the support site for Stroustrup: "Programming: Principles and Practice using C++" Addison-Wesley 2009, ISBN 978-0321543721. This book is based on a course I designed for engineering freshmen at Texas A&M University. It has now been taught by me and others, at TAMU, and elsewhere, in academia and industry, for almost five years and to thousands of students. It is currently available in (physical and web) book stores. Note this is not the 4th edition of The C++ Programming Language and it uses the current ISO standard C++, C++98, rather than C++11. This page and its supporting material is under construction. Comments and suggestions are welcome. In particular, I'd like to hear if someone adopts the book for a course. Maybe we could set up a mechanism for sharing experience. What do such numbers mean? Not much; e.g., is the word count a sign of "lots of useful information" or proof of verbosity? I prefer the former explanation. An RGB color chart for use with the graphics chapters. PPP-public: a google group for people who want to dicuss the book as part of courses. Note that different compilation systems and programmer communities have different conventions for where to put header files. The book assumes that a header file is in the same directory/folder as the .cpp files and uses "plain" #include "std_lib_facilities.h". If that doesn't work, try #include "../std_lib_facilities.h" (one level up) and #include "../../std_lib_facilities.h" (two levels up). First "mysterious" version calculator example for Chapter 6 page 202 "Try This". Be-bugged calculator example for Chapter 6 exercise in debugging. Be-bugged calculator example for Chapter 7 exercise in debugging. FLTK source files from FLTK.org from which you can build the FLTK Graphical User Interface (GUI) library and toolset. I am assuming that you (the reader) have a working modern C++ compiler. If you are a student on a programming course, your school will have installed one and there will be teachers or teaching assistent to help you in case of trouble. If you are on your own and not an experienced programmer, I strongly recommend you seek help from someone who has installed software before. One problem is that there are lots of C++ compilers and operating system distributions, so I can't simply provide you with a simple description of how to install: It will depend on "which compiler?" and which "operating system?" Here is a writeup sent to me by a reader using the Ubuntu distribution of Linux and GCC. And here is a Makefile for Mac sent by a reader. Why birds? Just because I like that photo; I was looking for a calm image. Sometimes a bird is just a bird. They are swans, by the way. Polish: Helion SA. March 2010. 978-83-246-2233-7. French - Pearson Educational France. 2010. ISBN 978-2-7440-7442-4. Support page with online appendices. errata. Portugese translation. Bookman Publishing. Artmed Editoria SA (Brazil). 2012. ISBN 987-85-7780-958-5. Free Software magazine by Ryan Cartwrigth. PPP is recommended reading for software developers by Intel on their Industry Education Recommended Reading List.